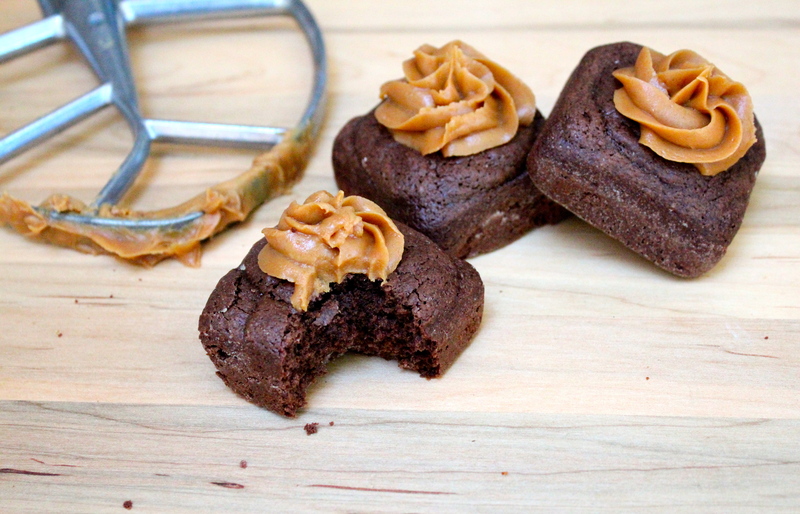 Happiness Project #38: The PERFECT Peanut Butter Brownies! Brownies. Let’s talk about Brownies. Brownies…perplex me. Because they’re very much like a cake yet flat, with a decisively fudgey texture. And by the way, how wonderful of a word is fudgey? It just screams summer days, languishing on the front lawn, with a scoop of half melted vanilla ice cream dripping joyfully down your fingers. Well, it does to me, anyway. Anyhow, back to the ever so elusive Brownie. I’ve been trying to create the PERFECT Brownie for well over a year now. No matter how many recipes I’ve tinkered with, nothing has just WORKED. Really? But for heavens sakes, why not, you’re wondering. The honest truth? I’m a brownie snob. In the worst way. They’re either too cake-like or too fudgey. Yet never both. And BOTH is what I want. So you can probably imagine how frustrating this year long quest of mine has been. Or ridiculous. Depending on how you see it. To make a long story short, about a month ago, I finally (FINALLY) figured it out. The PERFECT Brownie. With peanut butter, just because. And yes, I am still dancing my silly Happy-Happy-Mama Dance. Because this Brownie is THAT good. Don’t believe me? Try it. You’ll see. Ready? Preheat your oven to 350 degrees. Spray or butter a 9×11 inch baking pan. Or use a 12 cup muffin pan, like I did in the above photo. Sur La Table has a lovely 12 cup square muffin pan by Fat Daddio which you can find on their website. Evenly coat the buttered pan with 1/3 cup flour and tap out any excess (flour). Set aside. In a small saucepan, over low heat, melt the chopped chocolate and butter until fully combined. Once melted, transfer to a medium sized mixing bowl and let cool slightly. Stir the sugar and peanut butter into the melted chocolate. Add the eggs, one at a time, beating with a wooden spoon until just combined. Stir in the vanilla extract. In another small bowl, sift together the flour, baking soda and salt. Slowly add the flour mixture to the chocolate mixer, until just combined. Pour the brownie batter into your buttered/floured pan, spreading evenly, making sure to reach into each corner. Bake for 19-20 minutes, until a toothpick, inserted in the center of the pan, comes out clean. Cool throughly, on a wire rack, before cutting up into 12 bars. Serve with vanilla ice cream. Or your favorite peanut butter frosting, like I did. We all know that there’s no such thing as too much chocolate with peanut butter. And there you have it, my friends. A little bit fudgey on the inside and a little bit cakey on the outside. Perfection? I think so. « Happiness Project #37: Baked Tuna Casserole! I love your posts, Colleen!! These brownies look awesome. Awe! Thank you Mary! I LOVE your blog name! Love it! Umm, yum! Peanut butter + brownie?? Get in my mouth now please!